Enjoy the final days of the Passover holiday, which concludes after nightfall on Saturday night. If you are able, take time off to enjoy the week long holiday. This Treat was last posted on April 13, 2014. While Passover is a commemoration of the story of the Exodus, there is also a special Fast of the Firstborns, which is observed on the 14th of Nisan, the day before the first seder. * It is observed only by the firstborn. This includes minors--except that, halachically, minors (under the age of bar/bat mitzvah) are not supposed to fast. Therefore, it has become the accepted practice that the firstborn’s father fasts instead. This Treat was published on April 2, 2015. On the morning before the seder, chametz may be eaten until the fourth halachic hour of the day. * Biur Chametz takes place before the fifth halachic hour of the day. 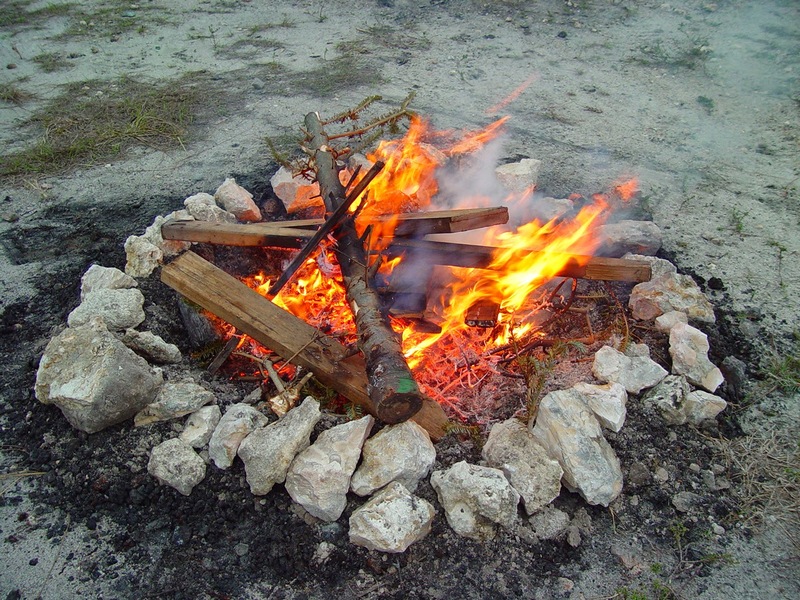 * In larger Jewish communities, there is frequently a designated location for Biur Chametz, often in conjunction with, and overseen by, the local fire department. This Treat was last posted on April 1, 20165. Get rid of the last of your chametz with a picnic supper if the weather permits. During the seder, there is an almost universal custom to “spill” a small drop of wine as each plague is recited. (How the wine is removed varies from family to family: some pour the wine out directly from the cup, while some dip a finger or spoon in the wine and remove a drop). Why do we do this? The Midrash tells us that as the Egyptians were meeting their horrible end in the churning waters of the Sea of Reeds (Red Sea), the angels wished to sing out praise to the A-lmighty. God rebuked them and said “My creations are drowning in the sea, and you wish to sing praises? !” (Talmud Megillah 10b). The custom of spilling the wine, explained theAbrabanel (a famous medieval Spanish commentator), is because wine is a sign of rejoicing. But one should not rejoice when an enemy falls, because they too are creations of God. This custom of spilling is also performed when the statement “Blood, Fire and A Column of Smoke” is read, that precedes the 10 plagues and also when reciting “D’tzach, Adash, B’achav,” Rabbi Judah’s mnemonic for remembering the plagues in order. One poignant Passover custom that can be found among Jews descended from the dispersed Spanish community is tapping the seder plate. The seder leader takes the seder plate and taps it or passes it over the head of the each seder participant. In some places, the custom is to do so three times for each participant. References to this custom have been found as early as the mid-fourteenth century. While many attribute luck-for-the-year-to come to this custom, this is a superstition that becomes associated with an already established custom. Like so many traditions of the Passover seder, the root of the custom of tapping participants’ heads with the seder plate is rooted in the desire to cause the children to ask questions. The seder plate is the equivalent to the table mentioned in Talmud Pesachim 115b: “Why do we remove the table (a custom noted earlier in the text)? The school of Rabbi Yannai said: So that the children will see and inquire.” As the table was removed, it was lifted over the heads of the participants or the children, and thus the custom evolved. Stay connected to your heritage by discussing the origins of your family customs. This Treat was last posted on April 11, 2014. This Treat was published on March 24, 2015. If you are still in need of Passover Seder accommodations, find out if a synagogue in your are is hosting a Passover Across America Seder or call your local rabbi for assistance. This Treat was last posted on April 9, 2014. 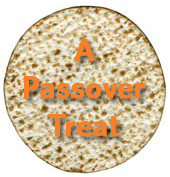 Shop for Passover supplies before it becomes last minute. This Treat was published on March 29, 2015. This Treat was last posted on April 4, 2014. Choose a haggadah that is both inspiring and easy to follow during the seder. What is chametz? Chametz is defined as leaven, any product in which wheat, oat, barley, spelt or rye come in contact with water for 18 minutes or longer (without kneading or manipulating). To be considered chametz, the food must be edible (defined as something that only a dog would eat). This Treat was published on March 23, 2015. 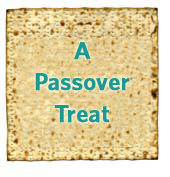 Don't let Passover preparations overwhelm you, begin simply by taking stock of the chametz that you currently have. If you follow @JewishTweets or are a Facebook follower of Jewish Treats, you might have noticed the incredible abundance of technical and medical breakthroughs that occur in the State of Israel. Dig a little deeper and you will find that many of the men and women behind these discoveries and inventions are graduates of the Technion - the Israel Institute of Technology. Established in 1912, the Tecknikum (as it was originally called) was conceived and sponsored by a German-Jewish fund. The hope was that the school would be a viable alternative for European Jews who were often restricted in their ability to attend university. Indeed, with the rise of the Nazis, it became a safe-haven for many brilliant scientists who fled Europe. Although the cornerstone for the Technion was laid in 1912, studies did not begin at the school until 1924, when it welcomed its first class of sixteen students (including one woman). The school had many noted supporters, including Albert Einstein, who planted the first palm tree in front of the original building in 1923. One of the major delays was the fierce debate concerning the language of instruction: German or Hebrew. The Technion’s first campus was located in the Hadar neighborhood of Haifa. It moved to its new, expanded campus in the 1950s, and today it has 10 academic facilities, 52 research centers and one affiliated teaching hospital. Three Technion professors have won Nobel Prizes, and an incredible number of the school’s graduates are leaders in the high-tech industry around the world. This Treat was last posted on March 20, 2015. This Shabbat, don't forget to include the prayers of Rosh Chodesh (listed in most siddurs). World Health Day, which is sponsored by the World Health Organization (WHO), is an annual event held on April 7th, the anniversary of the founding of the WHO in 1948. A sub-agency of the United Nations, the WHO concerns itself with international health matters. This year, the focus of World Health Day is the growing concern regarding the reported increase in diabetes throughout the world. Although cases of people suffering the symptoms of diabetes have been found throughout the ancient world, neither the Torah nor the Talmud discuss it directly. As is well-known, Type II Diabetes is closely related to lifestyle, and many of the recommendations for healthy living in order to avoid diabetes are encouraged in Jewish tradition as well. One critical factor in preventing Type II diabetes is maintaining a healthy diet. Not only do the sages stress the importance of eating vegetables (Talmud Eiruvin 55b - “No scholar should dwell in a town where vegetables are unobtainable”), but gluttony is also one of the 365 negative commandments. Exercise is also considered vital to staving off diabetes. As is frequently noted in the media today, a lifestyle without exercise is extremely detrimental. This fact was pointed out by Rabbi Moses ben Maimon (Maimonides - 12th century Spain), “As long as you exercise, take care not to eat to the point of satiation and keep your bowels soft, you will not fall ill and your strength will increase. . .The opposite is true of someone who leads a sedentary life and takes no exercise” (Hilchot Deot 4:15). Follow your doctor's advice to maintain your optimal health. The story of the great masses of Eastern European Jews who arrived in New York and settled on the Lower East Side of Manhattan is now more than conventional history, but an ingrained narrative of American Jewry. Back on the eastern side of the Atlantic Ocean, a similar history was unfolding on a smaller scale, only the port was Glasgow, and the tenement neighborhood that became home to multitudes of immigrants was called the Gorbals. Until the influx of Russian and Eastern European Jews at the end of the 19th century, Scotland’s Jewish population had been quite small. Although there are reports of individual Jews who settled there prior to the 1800s, the early history of the Scottish Jewish community is marked by individuals such as Levi Marks a student at the University of Glasgow (where he was able to avoid having to swear a religious oath) and Herman Lyon, a dentist of German origin who was buried in Edinburgh. The first Jewish congregations in Scotland were founded in Edinburgh in 1816 and in Glasgow in 1823. Similar to the story of the Russian/Eastern European Jewish migration that came to New York in the late 1800s, the Jews who came to Glasgow were often impoverished and uneducated, but dedicated to bettering their lots. As in New York, they too became peddlers and merchants and slowly built successful lives. As immigration levelled out, the Jewish population of Scotland became more established and then slowly began to decline, particularly as many young adults left to attain a higher education abroad and did not return. Scottish Jews, however, have tremendous pride in their dual identities, as can be seen by the excitement resulting from the recent approval for, and issuing of, an official tartan* for the Jewish people of Scotland. This Treat is in honor of Tartan Day, a North American celebration of Scottish heritages.